A critical performance issue for a number of scientific and engineering applications is the efficient transfer of data to secondary storage. 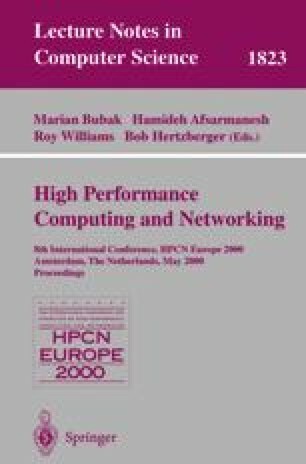 Languages such as High Performance Fortran (HPF) have been introduced to allow programming distributed-memory systems at a relatively high level of abstraction. However, the present version of HPF does not provide appropriate constructs for controlling the parallel I/O capabilities of these systems. In this paper, constructs to specify parallel I/O operations on multidimensional arrays in the context of HPF are proposed. The paper also presents implementation concepts that are based on the HPF compiler developed at the University of Vienna and the parallel I/O runtime system Panda developed at the University of Illinois. Experimental performance results are discussed in the context of financial management and traffic simulation applications. The work described in this paper is being carried out as part of the research project “Aurora” supported by the Austrian Research Foundation, and is also supported by NASA under grant NAGW 4244 and the Department of Energy under grant B341494.